My green beans are slowly wilting. It has been too hot for them. Blast this September you would think it's July weather. I haven't even planted my late season greens for fear that they wouldn't even sprout or would die shortly thereafter. You know it's bad when you go to the tanning bed to get some vitamin D because it's too dang hot to lay in your hammock outside. This heat is ruining all of my fall plans thus far. Anyway, I was craving something spicy to help clear up a little throat/sinus issue I was having and this is what I came up with. Said throat/sinus issue has also made me miss two WOD's this week. Now I'm just ticked. Yucky weather + no WOD + throat/sinus crap = effing PO'ed. These made me feel a little better...so did some awesome super spicy Tom Yum from my favorite Thai restaurant...that stuff will cure anything! Heat the oil in a large sauté pan over media heat. Add the green beans, stirring so they coat with the melted oil, and cook for about 3 minutes. Add the water and cover, cooking the beans until they are crisp tender, about 5-10 minutes depending on the size of your green beans. 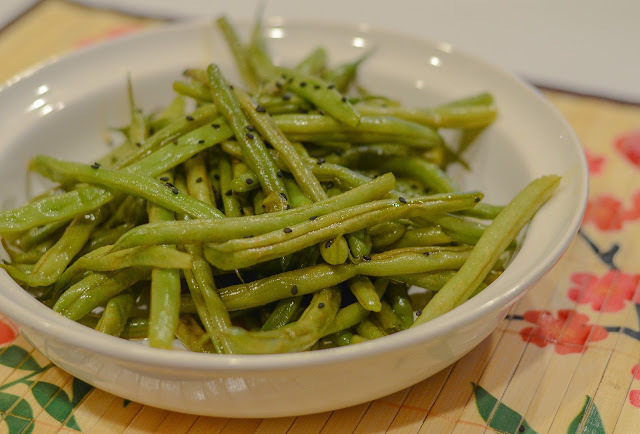 (Crisp tender means that they have turned a different color green and are tender on the bean but still slightly crisp). Add the honey and sriracha, stirring until the honey has melted. Reduce the heat to low and continue cooking and stirring intermittently until the honey and water have made a glaze, about an additional 3-7 minutes. Season with salt to taste and finish with black sesame seeds. The meaning of this is that you actually burn fat by consuming Coconut Fats (also coconut milk, coconut cream and coconut oil).